As part of their Vivaldi Edition, Naïve enables the collector to explore the extensive variety of the composer’s output from the collections housed at the National University Library in Turin. Described by Naïve as “The greatest recording venture of the 21st century” they are in the process of recording by category (sacred music, opera, concerti for winds, concerti for violin, cantata, etc.) the 450 manuscripts from the Turin collection. These manuscripts are from Vivaldi's personal collection of his own, hand-written music scores; his own private library at the time of his death. One cannot help noticing Naïve’s strategy of using glamorous young photographic models on the front covers of their Vivaldi Edition. Although totally irrelevant to the music this imaginative approach is proving to be an inspired and successful, if controversial and highly recognisable, marketing exercise. I can vouch that Naïve are using the finest possible period-instrument ensembles, eminent baroque vocal specialists and the best choral ensembles in the field of historically informed performance. On this release, Rolf Lislevand is the soloist who presides over cutting-edge interpretations, employing a talented group of specialist period-instrument performers. We are told that Lislevand in the early 1990s founded and is director of the authentic-performance group, the Ensemble Kapsberger. It is not clear if they are performing on this release. Lislevand first came to my attention a few years ago with a revelatory recital of unaccompanied seventeenth century French lute music titled ‘La Belle Homicide’ on Astrée Naïve E 8880. This superb release, recorded in 2003 at Maguelone Abbey in France, won my vote as a ‘2003 Record of the Year’. The substantial annotation is sloppy at times being frustratingly lacking in necessary detail and accuracy. For example, the works for mandolin and for lute were evidently recorded ten years apart using two sets of performers. Confusingly we are not told who is performing what type of instrument on each individual work. It is a sorry state of affairs not to credit the names of all the soloists on a disc of concertos. Bizarrely a comprehensive list of the instruments used on the recording and the name of the maker and date is provided but not the identity of who is playing them and on what work. 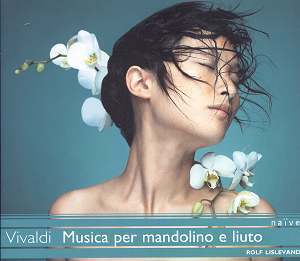 The Concerto in C major, RV 425, described in the Vivaldi thematic catalogues as a work for single mandolin soloist, is described incorrectly in the essay by Roger Tellart as being for two mandolins. Furthermore some essential translations into English are omitted. I would have found helpful some information on the six types of guitar/lutes/mandolins used. My request to the Naïve management for clarification on the performers has not as yet produced a reply. The six attractive scores on the disc follow Vivaldi’s usual three movement fast-slow-fast design. The first work is the outstanding Concerto for 2 mandolins, strings and basso continuo, RV 532 with its buoyant and vivacious opening Allegro. The central Andante contains an intimate dialogue between the mandolin soloists and the final Allegro is quite stunning being packed with incident. The Trio for violin, lute and basso continuo, RV 85 is a generally introverted score and barely decorative. The Larghetto is tender and meditative with a closing Allegro that just bursts with energy. The Concerto for mandolin, strings and basso continuo, RV 425 is an excellent score with vigorous and rhythmic outer Allegros and an enchanting central Largo of contemplative and nocturnal quality. Throughout the Mandolin Concerto one cannot help but notice the richly written parts for the string section. In the Concerto for viola d’amore, lute, strings and basso continuo, RV 540, the unusual blend of the two solo instruments is entrancing. The tender central movement Largo is evocative of a musical interchange between two lovers. I loved the playful Allegro that closes the Double Concerto. I found the Trio for violin, lute and basso continuo, RV 82 an impressive score. It contains two good-humoured examples of the Allegro movement placed either side of a relaxing and affectionate Larghetto lento. The final score is the Concerto for 2 violins, lute and basso continuo in D major, RV 93. The melodic and memorable outer movements consist of an exciting and spirited opening Allegro giusto with a closing Allegro high on joie de vivre. The finest of all is the central movement Largo with one of the most beautiful melodies ever played on the lute. This is a score that could certainly be regarded as one of Vivaldi’s greatest hits. Lislevand is an outstanding baroque guitarist who commands respect from the first note to the last with stunning interpretations that are awash with colour. He is at one with the emotional and technical demands of the music and I loved the way he imparts a spiritual, almost ethereal quality to the slow movements. The accompaniment is of the highest quality and I especially enjoyed the rich and varied basso continuo. The Naïve engineers have provided especially warm and detailed sonics. The very close sound-picture at times even captures the breathing of the soloists and the operation of the instruments but the ear soon becomes accustomed. I retain fond memories of the 1984 Hyperion recording of the same programme of mandolin and lute works from soloist Paul O’Dette and The Parley of Instruments under Roy Goodman and Peter Holman. Using period instruments O’Dette’s expressive playing thrilled and delighted me immediately from its release in 1985 on audio cassette KA66160; now available on Hyperion CDA66160. Lislevand displays his impeccable credentials on this superbly performed and recorded release of Vivaldi mandolin and lute works from Naïve.